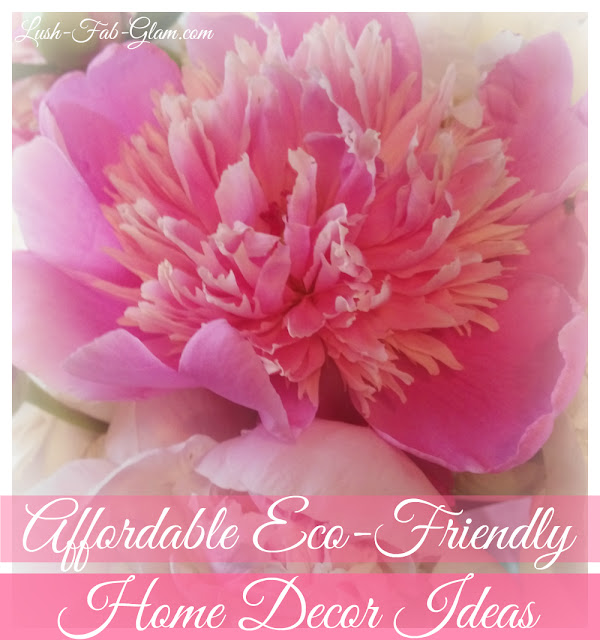 Affordable Eco-Friendly Home Decor Ideas. Going green isn’t just for the activists, it’s important for everyone to be aware and environmentally conscious in this ever-changing world. You can make big changes by going eco-friendly with your home decor and you don’t have to spend extreme amounts of money transforming your home into an eco-friendly paradise. When decorating your home, you might already have many of the things you need. Look through your stuff and see what can be re-purposed or reused. Doing so will save these items from becoming more junk in a landfill. Also, by re-purposing something you will do your part in cutting down the need for things like lumber, volatile glues and paints. Maybe you have an old ladder outside that rarely gets used, or isn’t sturdy enough anymore. Instead of throwing it out, you could turn it into something else. Use it as a towel or clothes rack in the bathroom, or a hanging pot rack in the kitchen. There are so many options for recycling old materials. Another good thing about going through what you already have, is that you can downsize. Sometimes clutter just causes chaos, and minimizing that can make a better home. Try a more minimalistic and relaxed approach when going green. Incorporating plants throughout your home will improve the mood and health of everyone in your household. Many plants are natural purifiers and promote the removal of harmful emissions from everyday items. For example, grocery bags, vinyl and other plastics release vapors that can be unhealthy., that odor you smell from new plastics? Don’t sniff it, it’s actually a toxic chemical called phthalate that’s released into the air from certain materials. This chemical can disrupt fertility, cause birth defects and affect your sweat glands. Sounds like having a few plants around the house is a good idea. Lemon Balm - This plant not only contains a super fragrant smell, it’s said to elevate your mood as well. It tolerates full sun or full shade, so no matter where you house it, it will flourish. Just don’t forget to water it. Peace Lily - Aside from being aesthetically pleasing, these plants are fabulous at removing more VOCs than almost any other houseplant. Philodendron - This lush and leafy plant is almost impossible to kill. Along with looking nice, this plant reduces the levels of VOCs and high CO2 in the air which can cause headaches and drowsiness. Water twice-weekly and you’ll eventually be saying that going green never felt so good! At some point in your home-owner life, you’ll be making some large changes. Maybe you’ll be getting new flooring, furniture or countertops. No matter what the focus is, when leading up to your big purchase, do thorough research before diving in. Take floors for example. Did you know that wall to wall carpeting produces formaldehyde gases and should be replaced every 7 years? Instead, think about using a renewable wood floor like bamboo or cork. It might be more expensive in the beginning, but refinishing is cheaper than replacing, so you will see profit over the years. If that’s out of budget, consider laminate flooring. There are some great patterns available, it doesn’t hold onto dirt and pollutants like carpet can, and it will last a considerably longer amount of time than a whole carpeted floor. Laminate, wood or even tile floors will give you the option of decorating in style. It’ll be easier to incorporate statement pieces, like an area rug, into various rooms with harder flooring. ​When purchasing furniture, check out the consignment shops in your area. Some locations also have stores that sell furniture from model homes. You can get almost brand new furniture for a really great price, and work on saving the environment at the same time. Remember - don’t over-use. When you take a shower, are you letting the hot water run out? When you brush your teeth, do you let the water trickle? Do you turn the lights off when leaving the room? Paying attention to everyday occurrences and changing some negative habits can really help impact your environment and put you on the right track to having an eco-friendly home and lifestyle. 5. Declutter and Give Back! After all of the hard work you’ve done in saving money while decorating your home, it’s time to get rid of the things that just create clutter. When you replace your furnishings or decorative items, donate them to a charity, put them up for free online or even in your yard. Who knows what pieces could be useful to someone else trying to re-purpose some old materials. Giving back not only reduces waste, it makes you feel better because helping others is just another way of going green. 2. Unusual Decor: Turning Everyday Items Into Fabulous Home Decor.